The most well-known of all the famous sailing ships, Cutty Sark traded from 1869 when she was built at Dumbarton on the Clyde until 1922. Built specifically for the tea trade with China she only worked in this trade until 1877. The Suez Canal was opened in the year in which she was built. This halved the time for steamships to make the journey back to the London. Sailing ships could not use the canal and had to go around the Cape of Good Hope. A short passage time was important in getting the season’s tea back to the London markets in order to get the best price. 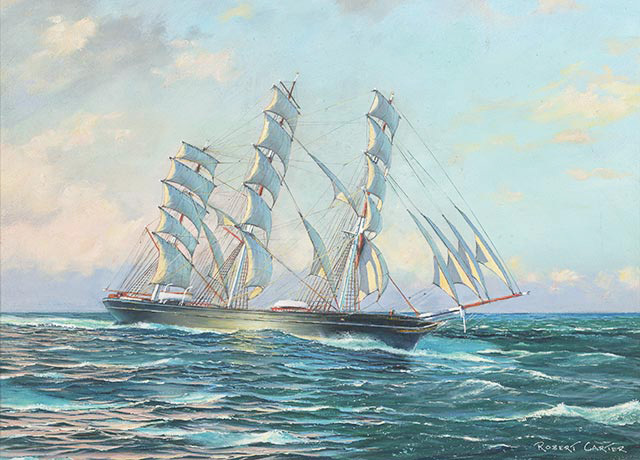 Cutty Sark then entered the Australian wool trade, taking out general cargo and returning with wool, hides and tallow. 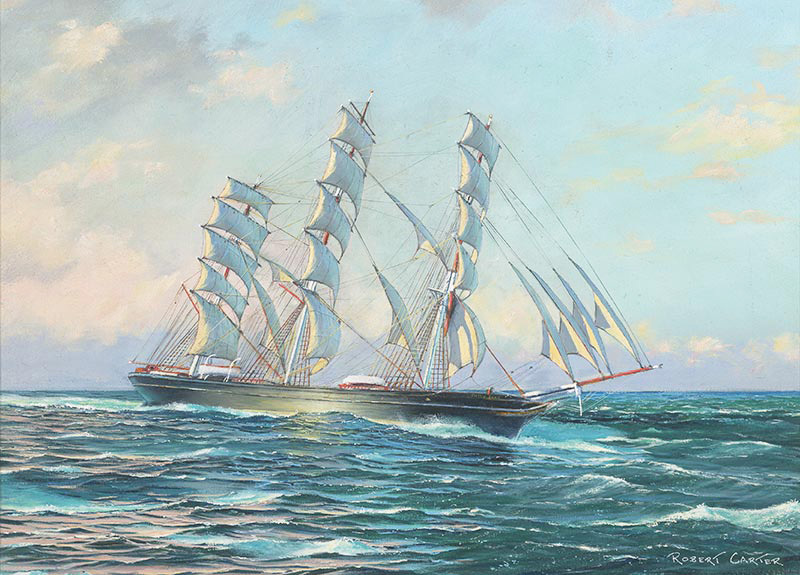 In 1895 she was bought by the Portuguese, cut down to a barquentine and renamed Ferriera. In 1922 she returned to British ownership, being bought by a Captain Dowman. 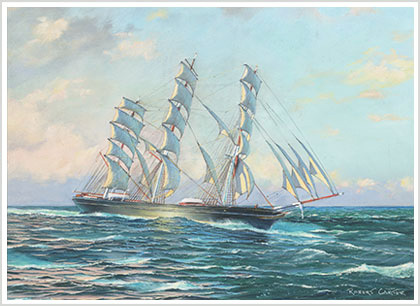 He had her re-rigged as a ship and she became a stationary training ship in Falmouth Harbour. In 1938 Mrs Dowman presented Cutty Sark to the Thames Nautical College. In 1953 she was handed to the Cutty Sark Preservation Society who installed her in a dry dock at Greenwich where she resides to this day. 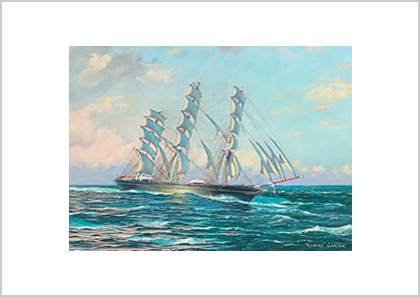 Cutty Sark has been painted by the world’s marine artists many times over, particularly those of contemporary times. Perhaps this is why she remained missing from my portfolio until only recently. I never found her internment in dry-dock at Greenwich particularly inspiring nor the few photographs that were taken of her during her trading days with China. Instead, the photographs of wool bales being screwed into her hold at Circular Quay allowed an imagined mixture of aromas of Stockholm tar and greasy wool to create the inspiration necessary to compose a painting that I could relate to. Image: 40 x 57.2 (cm) / 15.8 x 22.5 (in) with a white border to allow for framing and matting.